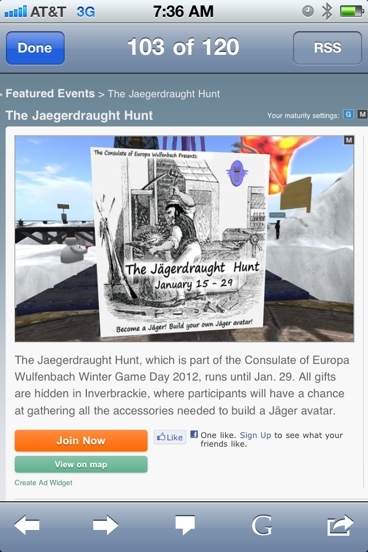 Congratulations to the Consulate of Europa Wulfenbach for putting together an extremely fun hunt, and for making “The Big Time” on the Second Life Destinations page. An entire sim, Inverbrackie, is devoted to wild, wacky, and wonderful builds, and members of the Consulate group and their friends have contributed everything needed to put together a JÃ¤germonster avatar (read Girl Genius! Right now!). My young ward, Bugginia, will probably be embracing her inner JÃ¤gerkin, as she had a LOT of fun tromping around in the snow dodging snowballs (courtesy of wizardess Ordinal Malaprop) and inspecting the carnage typical of a lava-based power station staffed by mutant snowpersons. What makes a hunt like this more fun? It’s personal, not too big, full of in-jokes and references to the Girl Genius “gas lamp fantasy” webcomic, and the clues are hilarious. Bug was rendered helpless with hysterical laughter as she followed the comical clues. Also, it’s achievable; it’s all in one sim, and the difficulty level sits in the sweet spot between “challenging” and “EVIL.” You do have to be pretty close to see the little golden Wulfenbach plaques, so “camming”from any distance is useful for spotting landmarks only (the sim is laid out like a hilly maze, wonderful for ambushes). Bug looks forward to drinking the JÃ¤gerdraught, which will either kill her or turn her into a drop-dead gorgeous JÃ¤germonstress.